Don’t panic. Don’t panic at that price. That’s for about 8 cookies. So $3.00 per cookie from a gluten-free bakery…that’s about what my local allergen-free bakery runs. Okay…with that public service announcement, welcome to yet another Cuisine Cube item! I’ve been doing really well this month working my way through my box of delicious goodies, not really leaving much to settle in the snack drawer or kitchen pantry. YAY! Cuisine Cube is a monthly subscription service were a gift box will be sent to your door with goodies inside. These are meal/pantry items that are the full-size products, not little sample sizes. That’s a huge deal, as most of the time these services send you sample products only. You can sign up for a monthly, three-month, or six-month subscription, which begin as low as $29.99 per month. Each box you receive will contain one item from each major meal of the day: breakfast, lunch, dinner, snack, dessert. And then, sometimes, you get a bonus treat. Bonus treats are always a nice and welcome surprise. I started with Cuisine Cube a year ago, and absolutely love it. So, as I’ve been working my way through the March Cube, I got into the dessert yesterday. We all know that I am a strong believer in dessert. I am even more of a believer when said dessert is…cookies. Because, first and foremost, I am a cookie monster. They are the perfect dessert and there are so many variations and textures. Love. You just don’t get bored with cookies. In the March 2015 Cuisine Cube, the dessert was a container of Gluten Free Double Chocolate Chip Cookies from Krumville Bake Shop, which is located in Brooklyn, New York. Krumville Bake Shop was founded by Antonella Zangheri, who was diagnosed with Celiac in 2009. She grew up in Emilia Romagna, a region of Italy known for its rich culinary heritage, and now she would be giving up many of the foods she grew up eating. Not only that, she was highly disappointed with the gluten-free products that were available, noting that she saw a need for more exciting options. And that is how Krumville Bake Shop was born. In fact, Zangheri creates amazing focaccia, cookies, muffins, and specialty cakes that taste as good as the foods she grew up eating – just minus the gluten! Krumville Bake Shop’s mission is to provide wholesome, fresh, and delicious gluten-free products, using only the best ingredients. All of Krumville’s products are free of GMOs, artificial flavorings, and preservatives. They use high quality flour blends that are made with whole grains (sorghum, brown rice, millet) and utilize a vast selection of ancient grains as well. By perfecting their special flour blends, Krumville can offer baked goods with unique flavors and extraordinary textures. And, to limit the use of refined sugar, the bake shop uses agave nectar as much as possible. I am falling even more in love the more I learn about this company. This month’s dessert option had me at Double Chocolate Chip Cookies. I mean…double your chocolate, double your delicious fun, right? I think so. I actually paid attention this time and noted the “Refrigerate Me” tag on the Cuisine Cube product rundown, so into the fridge these went. And as April has gotten under way, I decided it was time to bust into these. So, last night after eating my Gluten-Free, Dairy-Free, Vegetarian Cheeseburger Pie…this was going to be dessert. I went to retrieve the clam-shell container from the fridge and popped it open. I removed two cookies…one for myself and one for my roommate to try. It was a very good thing that I then put the container back in the fridge, because I don’t know if I would have stopped at one cookie. First of all…these cookies have a perfect texture. Crunchy outside and a bit of chewiness on the inside. They explode, with each bite, with fantastic chocolate flavor. I mean…wow. Not overpowering. Not too much. But just right. It satisfies that every craving for chocolate. Seriously. Because the cookie has this richness to it, and then you get this little burst of dark chocolate with the chips baked into them. It’s one of the most perfect cookies ever. They are about the size of a Chips-Ahoy Cookie…but way better than any of that processed garbage I used to eat. These…are amazing. Bite-for-bite. But hide them away in the fridge, or you may find yourself cookie-less and 3 pounds heavier for it. The container doesn’t have any of the nutrition information on there, so I can’t give you the rundown of calories/fat and all that per serving…but I can tell you what ingredients go into these fantastic cookies. 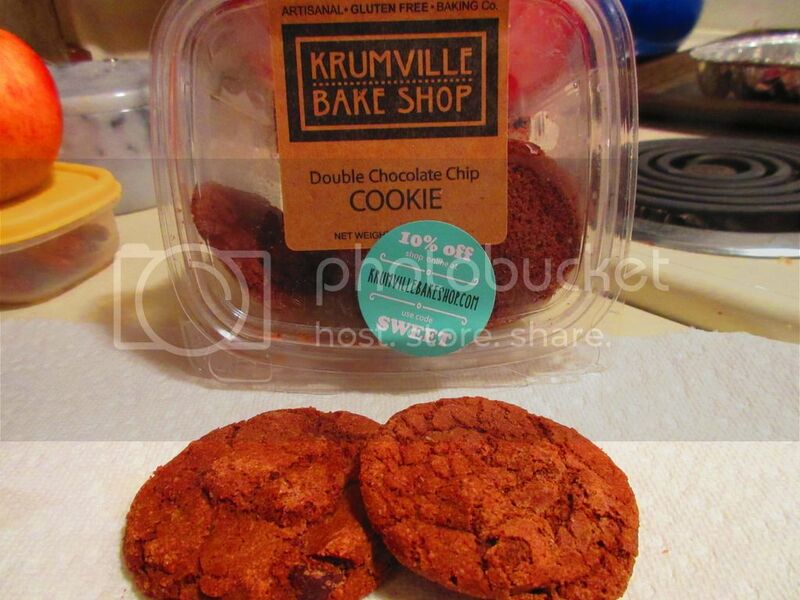 The Krumville Bake Shop Double Chocolate Chip Cookies are made from Guittard chocolate, unsalted butter, dark brown sugar, brown rice flour, light brown sugar, sorghum flour, eggs, pure cane sugar, potato starch, milk, sweet rice flour, rice starch, vanilla extract, baking soda, sea salt, and xanthan gum. Believe me when I say that these cookies are phenomenal. They are the right hit of sweetness and that perfect level of chocolate for this major chocaholic. For real. I am glad these get tucked away after I pull out that night’s worth for my roommate and I because we’d probably kill off the entire container in one go. Dessert and cookie perfection. Nicely done Krumville Bake Shop and Cuisine Cube. This entry was posted in Baked Goods, Chocolate, Cookies, Cuisine Cube, Dessert, Food, Gluten-Free, Products, Review, Snacks, Sweet Stuff, Vegetarian by The Celiathlete. Bookmark the permalink.